As we here in the States are giving our thanks and digesting our bountiful dinners this Thanksgiving, it seems an opportune time to share a few words spoken by some voices from the past. A one-of-a-kind glimpse into a different time, courtesy of one family and their home record lathe. This Motorola Home Recording Disc was cut on December 1, 1942 and November 22, 1944, likely somewhere in Texas, as that’s where I found it. 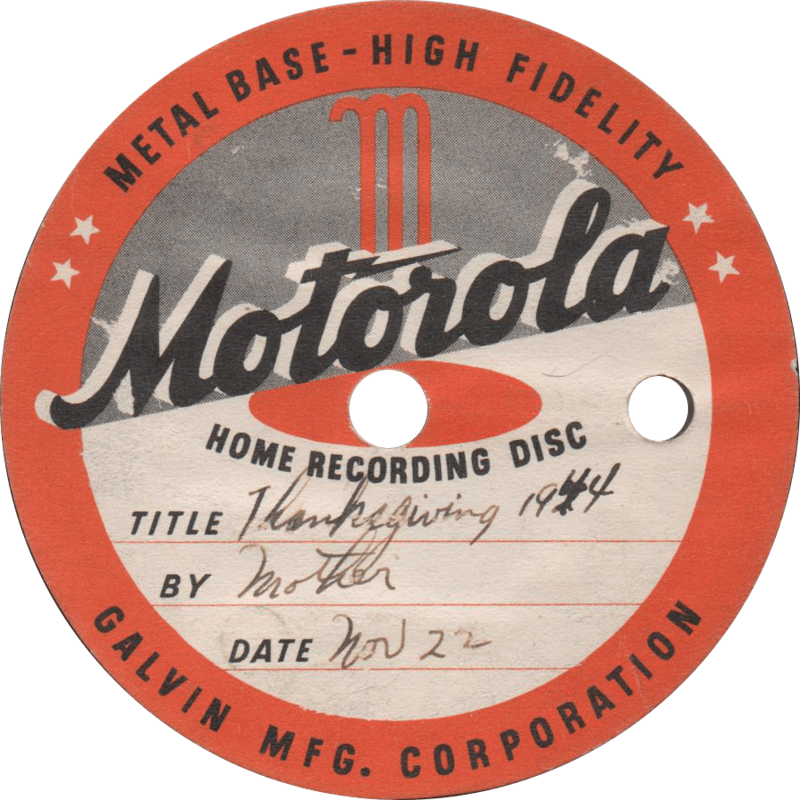 Thanksgiving 1944, recorded November 22, 1944 by Mother. On the other side of this home recording, cut two years before the first, Mother recounts “When Norman Left Home” for Officer Candidate School. Alas, this side doesn’t play quite as well as the other one. 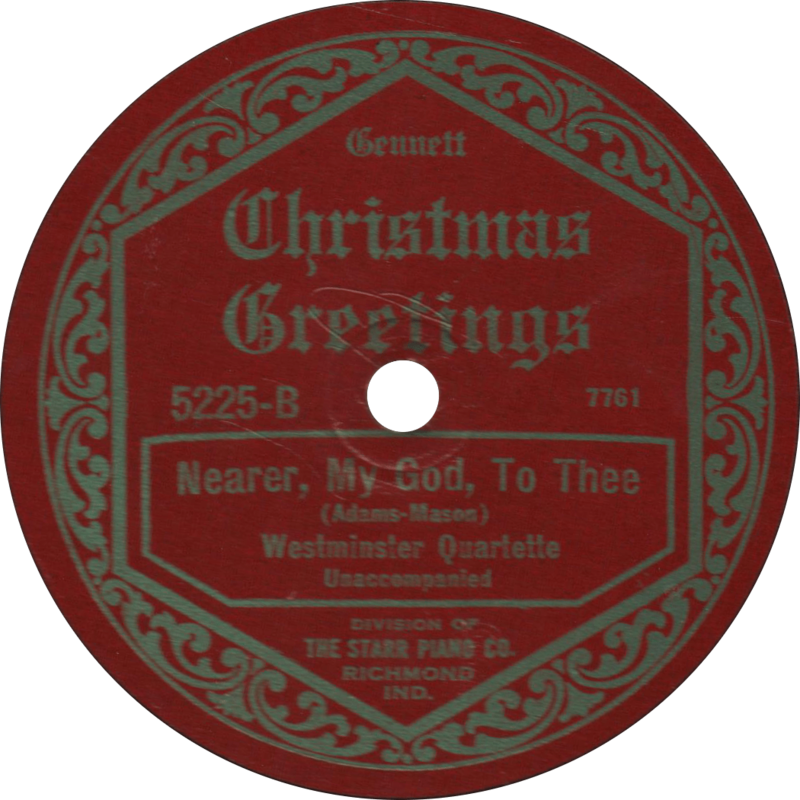 When Norman Left Home, recorded December 1, 1942 by Mother. Merry Christmas from Old Time Blues! 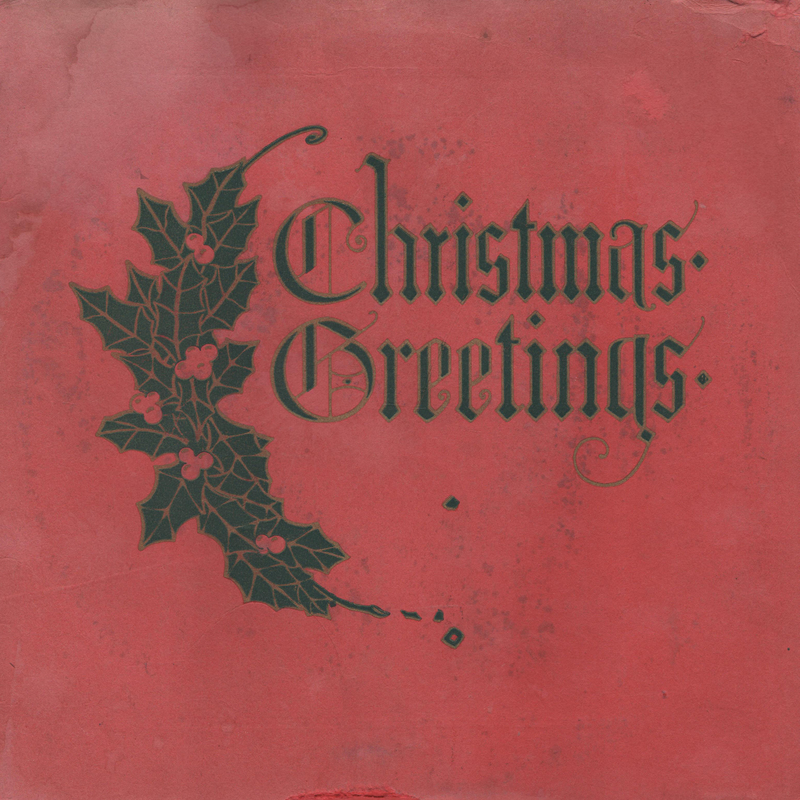 Christmas Greetings from the folks at Gennett Records, and here at Old Time Blues! Bryan and the Lord’s Prayer. 2015 being the first Christmastime we’ve had at Old Time Blues, I think it would be appropriate to start a new tradition, one record to share every Christmas eve, similar to the way that the folks over at Shorpy post that same office party photograph every Christmas. Made specially by Starr Piano Company for the Christmas season, I think this is the perfect record to start such a tradition. Now, on December 25, 2015, 2016, 2017, 2018, a whole three years later, Old Time Blues continues in our yuletide tradition of celebrating a very William Jennings Bryan Christmas! 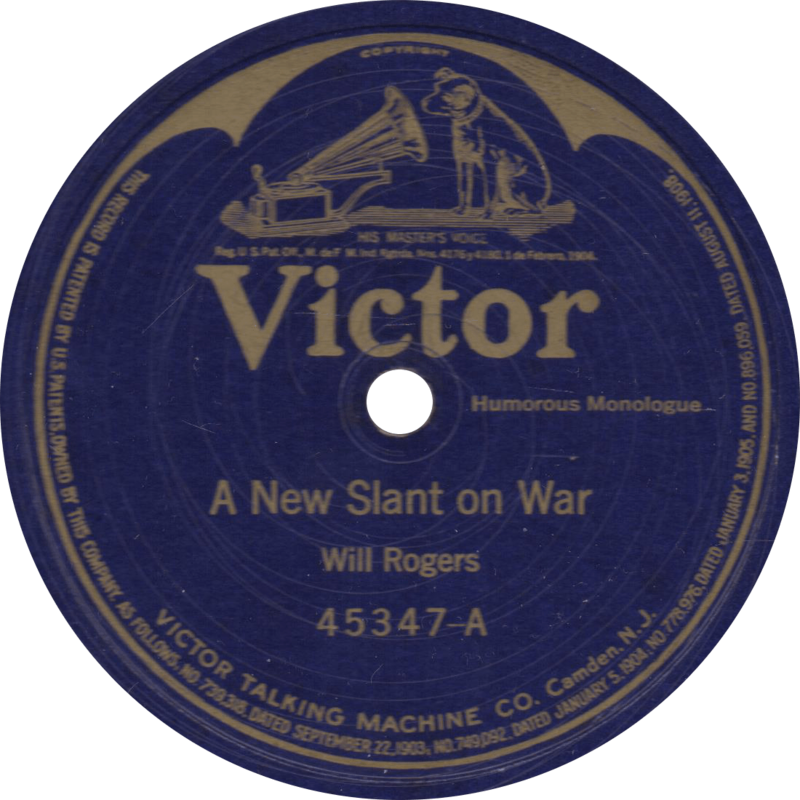 Gennett 5225 was recorded June 30, 1923 and February 1922, respectively, presumably both at the Gennett studio of the Starr Piano Company in Richmond, Indiana. 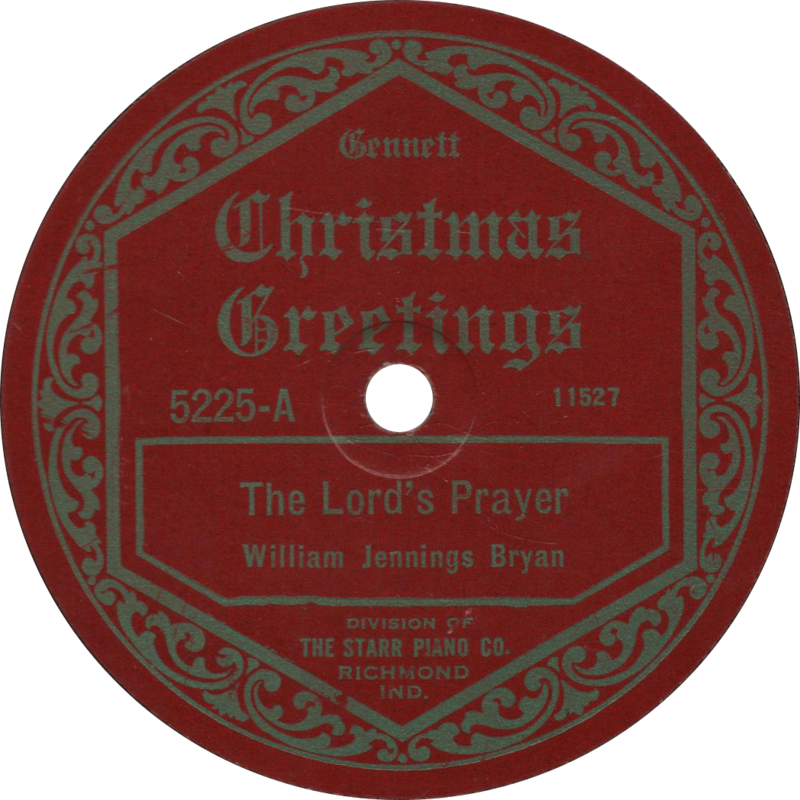 On this special Christmas Greetings disc, former Secretary of State, three time Democratic Presidential candidate, and esteemed orator William Jennings Bryan delivers a recitation of the Lord’s Prayer. 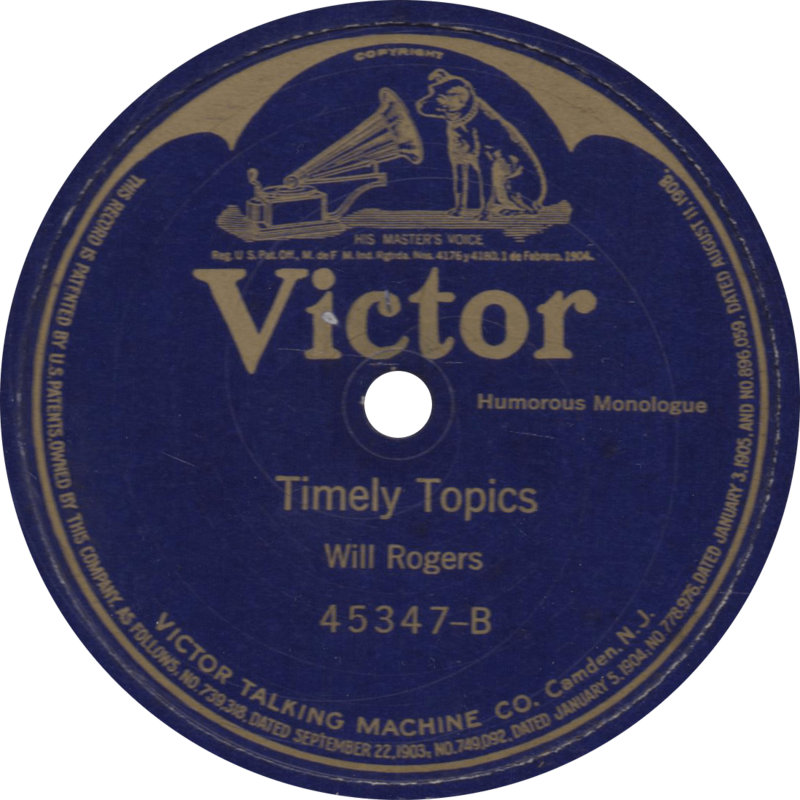 I don’t know about you, but I cherish this rare opportunity to hear the voice of the “Great Commoner” on phonograph record. 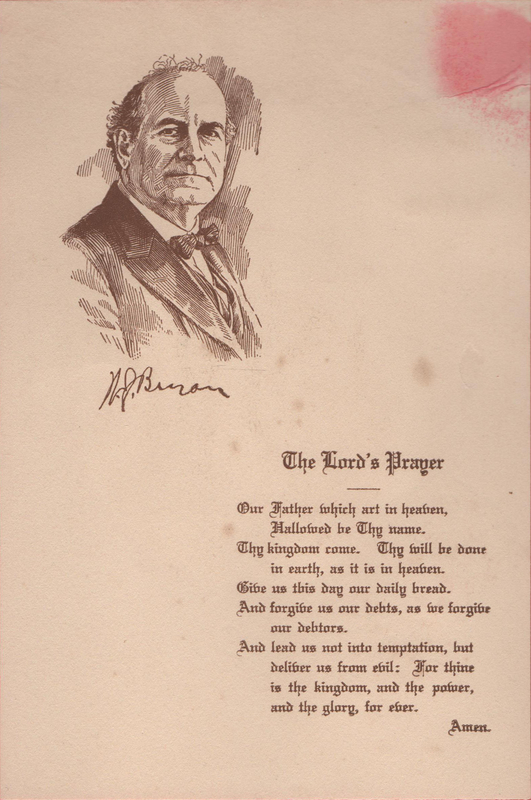 The Lord’s Prayer, recorded June 30, 1923 by William Jennings Bryan. On the back of this record, the Westminster Quartette sings a solemn a capella rendition of “Nearer, My God, To Thee”. Nearer, My God, To Thee, recorded February 1922 by the Westminster Quartette. Updated with improved audio on December 25, 2016. This Okeh custom pressing, titled Hello World 001, was made in 1930 for the owner of KWKH radio in Shreveport, Louisiana, one W.K. Henderson. The first side, by Henderson himself, was recorded on February 18, 1930 in Shreveport, Louisiana, and the second, by country artist Blind Andy, was recorded March 5, 1930 in New York. Henderson recorded three other talks that day, but none were released. William Kennon Henderson, Jr., was born in Bastrop, Louisiana in 1880 and made his fortune as owner and president of the Henderson Iron Works and Supply Company. 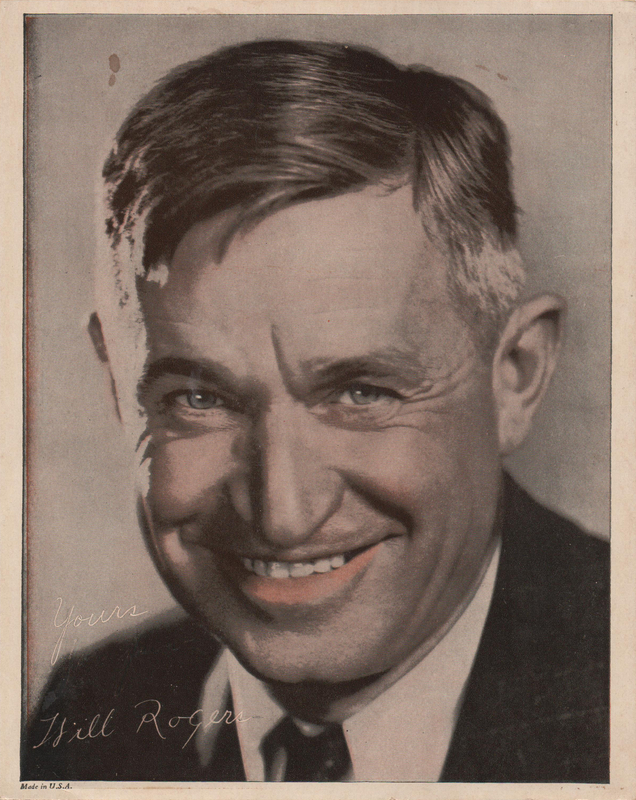 Henderson became interested in radio in 1923, when he was requested by Shreveport radio station WGAQ to help fund a replacement of their low-powered transmitter. In 1925, he bought the station and renamed it KWKH, the callsign representing his initials. Broadcasting across many states with his 50,000 watt station, Henderson made a name for himself with his rural brand of humor and his heated, profanity-laced political rants against chain stores, large corporations, the Federal Radio Commision, and the establishment in general. Henderson was a long time friend and associate of governor Huey Long, who appeared as a guest on the station occasionally, along with some of his allies. Long also aided Henderson in keeping government regulation away from his controversial broadcasts. Henderson also founded an alliance of small business owners dubbed the Modern Minute Men (MMM), which at one point claimed around 32,000 members nationally and raised almost $375,000 for Henderson. Despite his attempts to exploit loopholes, Henderson was an enemy of the fledgling Federal Radio Commission for his repeated and numerous violations of their policies, including his obscenity laced monologues and his reliance on “canned music”. 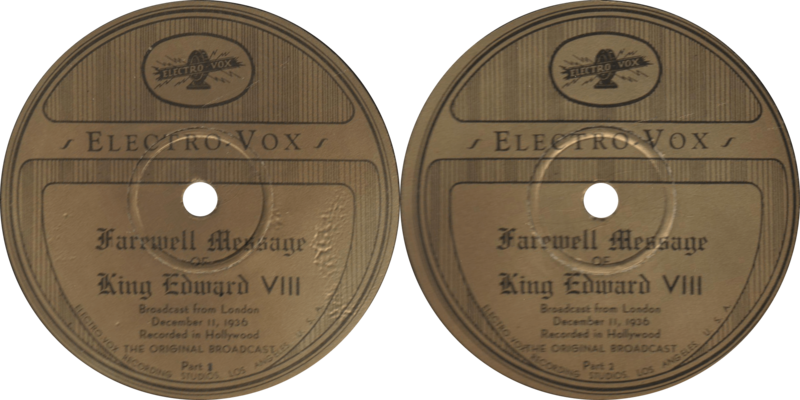 In 1931, Governor Long had a falling out with Henderson, and the Federal Radio Commission ordered an inquiry into the affairs of KWKH. That combined with hard times brought on by the Great Depression saw him to declare bankruptcy and sell the station in 1932. On his death bed in 1945, Henderson said, “I was right, you know… I guess I was fighting for free speech and free enterprise.” KWKH would later gain new fame for their “Louisiana Hayride” program beginning in 1948, which eventually featured a young singer by the name of Elvis Presley in the 1950s. Recorded by Okeh in Shreveport, Louisiana, W.K. Henderson tones down his act considerably for the record’s first side, “Hello World”, a diatribe from Henderson about other stations interfering KWKH’s frequency of 850 kilocycles by WABC in New York, a “chain outfit,” WLS in Chicago, that “Sears-Rareback outfit,” and WENR, and the entity responsible for the interference, the Federal Radio Commission. 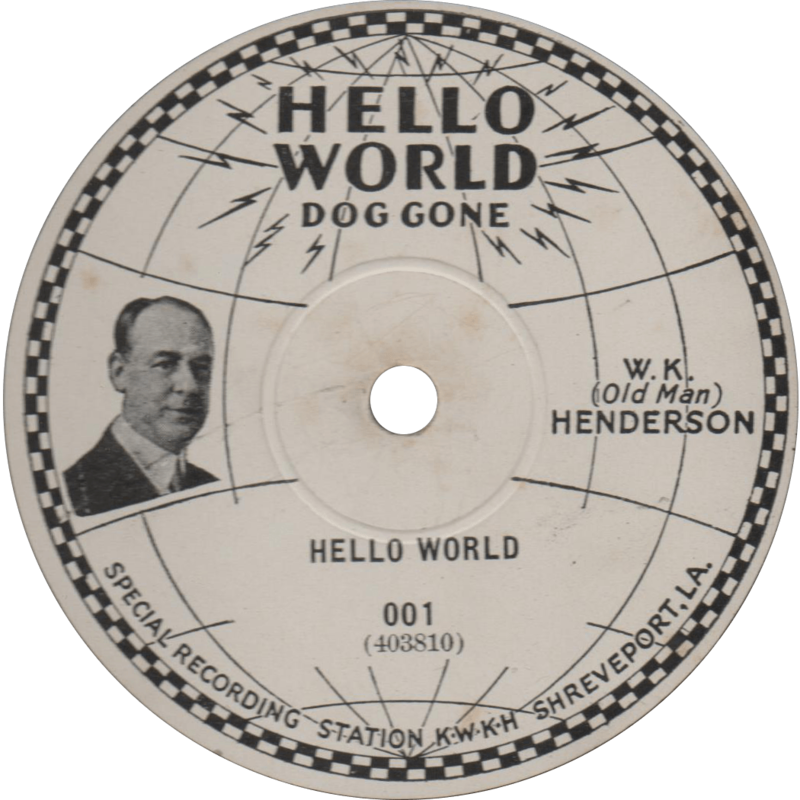 Hello World, recorded February 18, 1930 by W.K. (Old Man) Henderson. On the flip-side, recorded March 5, 1930 in New York City, noted country and gospel artist Andrew Jenkins performs “Hello World Song (Don’t You Go ‘Way)”, a well-done country song set to the tune of his older composition, “The Death of Floyd Collins”. Blind Andy warns listeners not to invest their money in the stock market and offers other bits of timely advice from the agenda of W.K. Henderson. 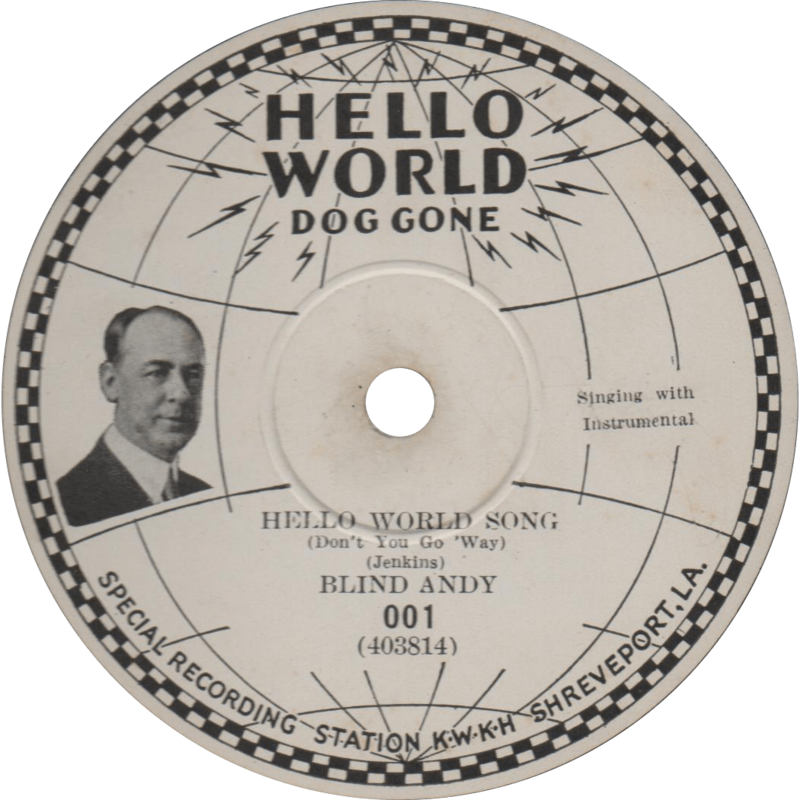 Hello World Song (Don’t You Go ‘Way), recorded March 5, 1930 by Blind Andy. Hello world, doggone ya. Now don’t you go away! Updated on October 21, 2015.